Ethnographic research for social media initiatives shows how ethnography can change the rules of social media programs in marketing, customer service, product development, recruiting and others. Ethnographic research enables teams to understand the people who are most important to your firm so they can relate to them at a completely different level. Moreover, interacting in digital public activates the network effect and the annuity effect, so it’s very scalable. Since your teams interact in digital public, where a far larger group of like people observes the interactions, they influence a large group of people and build relationships with them. People start trusting your firm, preferring your firm, and doing more business with you. See the Trust Business Chain Reaction and infographic for how it monetizes. Ethnographic research for social media initiatives is a game-changer for customer experience and digital transformation programs in multiple phases. It’s faster, less costly, and scalable. It provides an unprecedented combination of qualitative and quantitative research. The Trust-Business Chain Reaction How Trust Monetizes describes one of the most disruptive and untapped forces in business, for it shows how trust monetizes at scale. Firms that act on it first can create exceptional advantage for themselves since the reaction grows geometrically. Here is how the reaction works—and how experiential social media activates it. 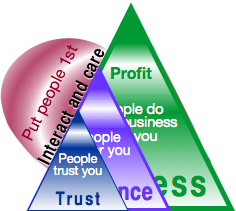 The Trust-Business Chain Reaction significantly increases profit and other business results in a surprisingly simple human way. It directly addresses customer experience and employee engagement. Are Websites or Social Media Better for B2B Lead Generation? As B2B continues to adopt social business, more word of mouth, i.e. personal referrals, happens online. Another reason I’m calling out this post is that it misinforms readers by treating “sales leads” as a homogeneous category. Our clients don’t care about general adoption; what’s more relevant is adoption by their prospects. This post treats all leads as the same, so it’s really the equivalent of informational fast food. To end on a dour note, misinformation can work to your advantage because your rivals may read it and believe while you can see through it, invest and pull ahead.